Jamal Khashoggi’s murder by a US ally has sparked outrage in the US, but dozens of journalists murdered under US-backed regimes in Honduras go unnoticed. The murder of Saudi opposition journalist Jamal Khashoggi was especially blatant. He entered a Saudi consulate in Turkey to pick up legal documents that would allow him to marry his fiancée. He never left. Turkish authorities claim to have recordings that prove he was tortured, killed and dismembered by Saudi officials in the consulate. Khashoggi’s murder has provoked a storm of criticism in the US. Trump is defending Saudi Arabia as a close ally who buys billions of dollars of military equipment from US companies and supports the US against “terrorism” and Iranian and Syrian influence. Saudi opposition journalist Jamal Khashoggi. Some Republicans, like senator Lindsey Graham, have broken with the president and promised serious economic sanctions against Saudi Arabia if its government is found responsible. Others, like several House Republicans, have begun a “whisper campaign” to defame Khashoggi as a terrorist sympathizer and so defend President Trump. Yet similar crimes linked to state security forces in Honduras draw no attention. In January 2017, television journalist Igor Padilla was gunned down by four men in police uniforms. His cameraman, Edvin Rivera Paz, fled to Mexico to seek refugee status, but was killed there in July. 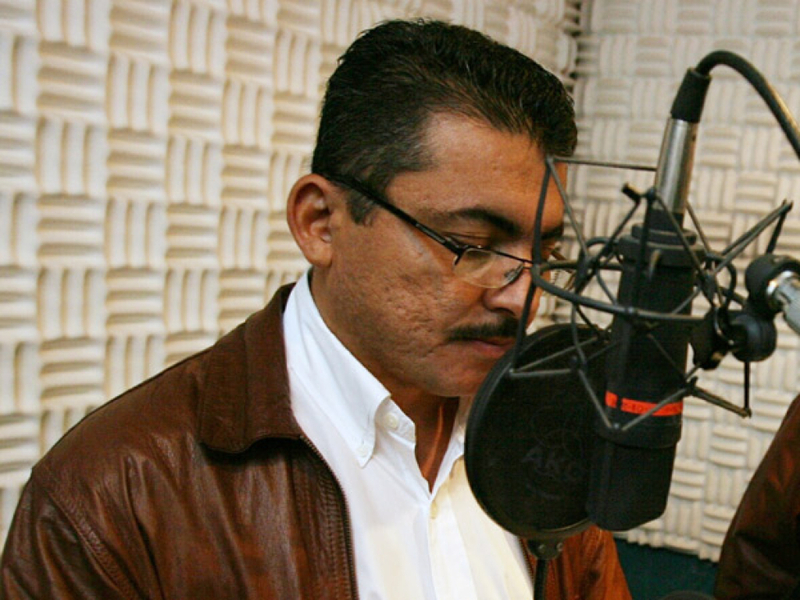 In 2012, the body of journalist Alfredo Villatoro was found in fatigues used by the US-trained special forces unit called the COBRAS. The list goes on. Dozens of journalists have been killed in Honduras in recent years, including 34 from 2012 to 2016, according to the Latin American Federation of Journalists. Alan Garcia, 17, was shot in the chest as he was protesting a hydroelectric dam on his community’s land. The military opened fire, wounding others and killing his father. Courtesy of Global Witness. Those who deposed President Zelaya in a 2009 military coup claimed it was because he would seek reelection. And yet the current president, Juan Orlando Hernández, faced no institutional resistance when he changed the constitution and won a second term despite serious allegations of election fraud in December 2017. Though the Organization of American States called for new elections, the US quickly recognized the results. 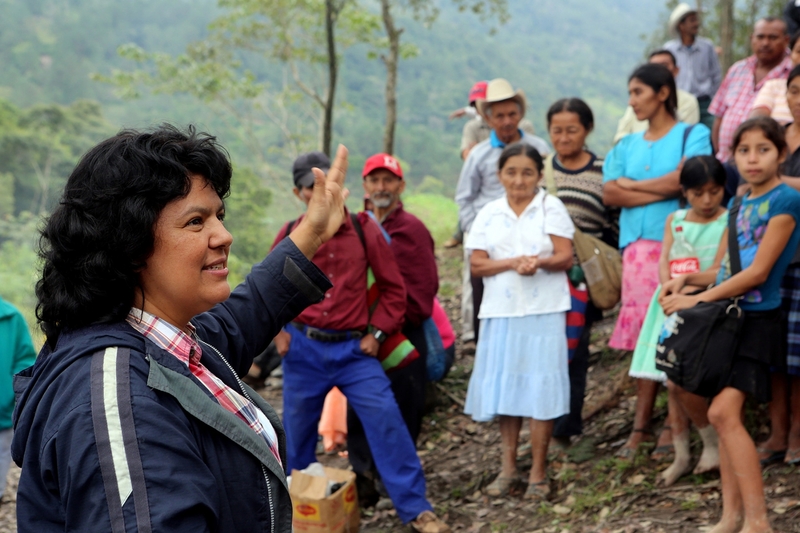 Lenca activist Berta Cáceres was murdered for her opposition to the Agua Zarca dam in 2016. Two of her colleagues have since been killed. 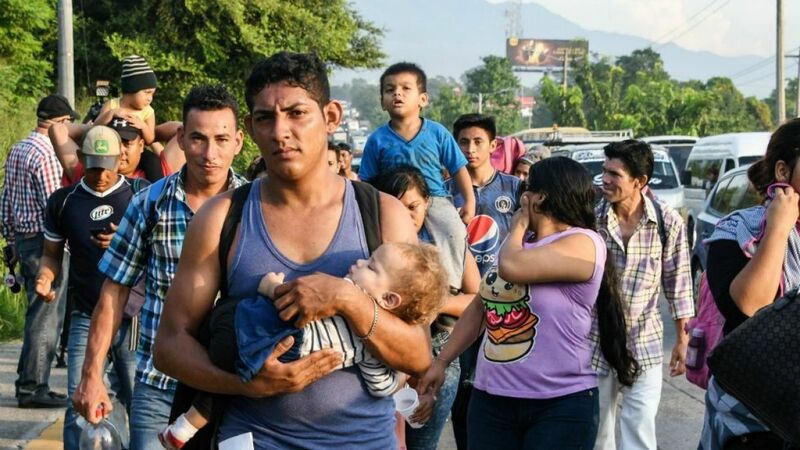 Members of a caravan of asylum seekers from Honduras and Guatemala. October 2018. Headline image: Father Ismael Moreno of Radio Progreso stands with protesters in Honduras. 2017. Courtesy of Radio Progreso.